The sweeping Elementae series continues with more elemental magic and heart-stopping romance, perfect for fans of Sarah J. Maas. Aspasia might be the captain of her own ship, but she isn't free. Forced to find and bring slaves to her own cruel slaver, Cyrus, Aspasia tries to free as many women, children, and Elementae—those who can control earth, air, fire, and water—as she can. 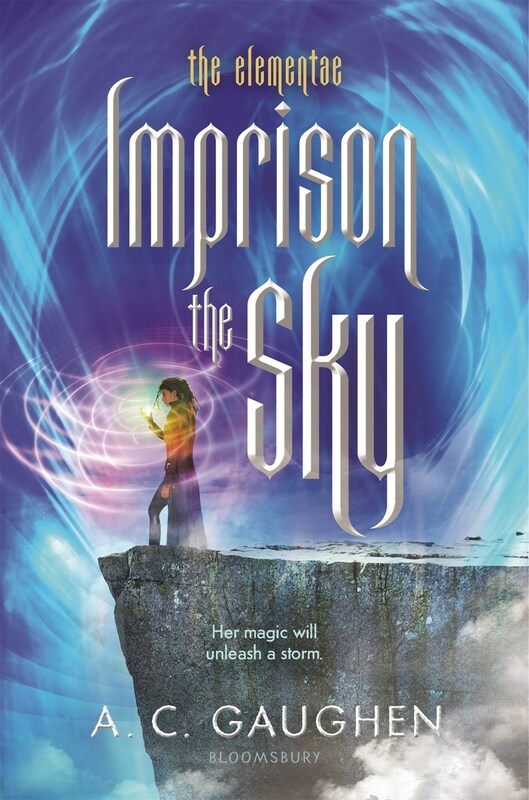 With her crew, Aspasia commands the seas and skies on her flying ship, but she is desperate to find her younger siblings who were kidnapped years ago. When she frees a young man with whispers of Elementae magic, Aspasia finds herself drawn to him. Kairos joins her crew, and she learns that he is the brother of the queen of the Bone Lands, who is leading a rebellion against her husband. Aspasia soon finds herself in the middle of a brewing war, but she'll have to outrun Cyrus—and worse—if she's going to fight for her family and her freedom. 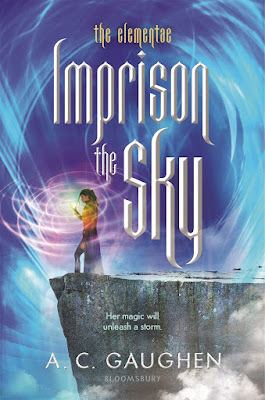 Imprison the Sky is the second installment in author A.C. Gaughen's The Elementae series. This story takes place after the ending of Reign the Earth, but with almost entirely new cast of characters. Aspasia is searching for her brother (Gryphon) and sister (Pera) who she was separated after being taken and sold as a slave. She owes her semi-freedom to a black marketer known as Cyrus. Asp is also a powerful air Elementae along with being Captain of the Ancora. Like Asp, her crew is a diverse collection of children and teens, all formerly enslaved, many with powers, who come from all the races and nations of Asp’s world. Asp and her crew are charged with transporting slaves and other goods to Cyrus. But, the crew has another mission: rescue slaves from the Trifectate who are experimenting and killing Elementae. If a slave has any Elementae ability, they give them the choice of staying with the crew, or being dropped off someplace off the beat and path. Asp is a curious character as well as a real badass. I loved her abilities that enabled her to fly, literally, her ship! She truly believes that she is a villain, but she's not. Not like Cyrus and Calix. She believes that her soul is forever being darkened by the misdeeds she is guilty for, that being the capture of slaves who she brings back to Cyrus to sell for a profit. She even keeps track of the number of slaves she frees, and the slaves that she ends up giving up to Cyrus trying to balance the books. But, Asp and her crew are a family. Not like Asp and her brother and sister. But, a family nonetheless because everything they do is voted on by the entire crew. Asp never once has a say in the crews choice. The relationship between Asp and Kairos is one of the slow burn variety. He is a known quantity to readers, she is someone who is hard to impress, especially when he has an entire different set of circumstances, challenges, and skill set. The question is always on the back burner. Will he stay, or will he leave? I've seen where reviewers have said it's not necessary to have read Reign the Earth. I respectively disagree. Aspasia, as well as Kairos are characters who appeared in the first installment. Kairos, in fact, is the brother of Shalia, the Queen of the Boneland who escaped her brutal husband, and is now in hiding. I will say that there is a whole lot of stuff that happens towards the end of this book where the previous installment's characters meet with this books characters for a battle royale. I think my main issue with this particular story is that I wanted to learn what happened after the end of the previous novel and was a bit surprised that it was Asp and Kairos who took over the series from Shalia. If you've read the first book, you know how the book ended. What you never did find out is how Shalia and Galen were able to avoid Calix, Shalia's brutal husband, and where they disappeared to. But, with the addition of Kairos, at least one question was answered. The story mentions Shalia and Galen, as well as Calix. I am curious where any sequel might go. Will it return to being Shalia's story, or a mixture of all the characters who have now been introduced? Maybe the sequel will answer your questions.